mouthing the words of Anna’s songs. What you need is some quite in the house and a more personalized audio device for your children. The concept of kids’ headphones have been around for a while. 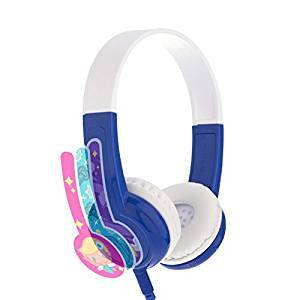 These are safer headphones for children that limit the volume and are visually more appealing to the kids. They are also designed to sit more comfortably on smaller ears. Regular headphones can be too heavy and too loud for children. To help you out, we researched and found the 10 best headphones for kids. These are spread over price range in both wired and wireless domain.Read our latest guide about the best noise cancelling headphones for kids. How are the kids’ headphones different from usual headphones? There are a few factors that set kids’ headphones apart from regular headphones. These features make them safe and suitable for prolonged use. Although caution demands that you do not let your kids spend more than 1 hour at a time with headphones on. Volume Limiter: It’s a common misconception that only extremely loud noises can damage your hearing. An explosive sound like that at a concert or crackers can do serious damage to your hearing or life. 109dBA volume can be fatal to humans. But that’s not why 20% of teens in US are affected by loss of hearing. Like Frozen, moderately loud volume wears your audio down over time. If you listen to audio at over moderate volume for 7-8 hours continuously, it will deteriorate your sense of hearing over a period of time. This is more common and more dangerous than a sudden sonic shock. In fact, most of us have already sustained damage to our hearing by the time we are in our 30s. There are intermittent bands of frequency that we can’t hear without actually perceiving a hearing loss. It takes specific tests to really understand the extent of damage consistent subjection to moderate volume has caused. often ignore the second part. While 85dB is the safe limit, it’s not safe enough for continuous listening. The hearing-loss experts suggest 70dB as the volume for repeated music playback over the day. This should not cause any significant damage over extended usage. The problem with 70dB volume limit is that most of the lower frequencies are inaudible at this volume. So you can’t take revel in the full, rich audio that’s audible at 85dB or more. Most children and teens are initiated to the digital ear with iPads which are louder than both iPhones and Android devices. This is because the internal amplifier of iPads is more powerful and hence able to pump out louder volumes than other devices. So effectively these can override the 85dB limit of these headphone. Ultimately, the responsibility of monitoring the volume of devices that kids’ use rests with the parents. You can always download a volume-limiter app and set the volume constraints. But we daresay that kids can find a way around them and raise the volume to unsafe levels. Size: Over-ear headphones are usually huge and can be pretty heavy too. A usual headphone weighs between 7 to 12 ounces. The more inexpensive sets are usually heavier if made out of quality materials. Kids have smaller ears and hence require only smaller headsets. The best kids’ headphones covered here are small and lightweight. 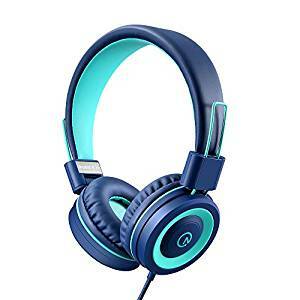 Such headphones do not put unnecessary stress on children’s neck and head. Earcups: Kid’s ears take time to grow into adult ears. They are smaller and hence require only smaller earcups. For children, it’s also easier to use an on-ear headphone than an over-ear headphone. The latter sweat the ears and are generally more geared towards audiophiles. The on-ear headphones provide better air circulation to the ears and generally has more diffused audio than the over-ear headphones. headphones, only the ones that look awesome. Which are the best headphones for kids? Safety: The most important consideration while picking headphones is knowing they will be safe for children to use in spite of their love for all things dangerous. We checked that these headphones are volume-limited or at least have an inline control to limit volume on short notice. Comfort: Children are finicky and they will absolutely not accept headphones that hurt their ears or head. We tested these headphones with kids to understand whether they were a Yay or Nay. Durability: If you thought Sauron was going to destroy the world, then you are mistaken. Children are more likely to do that. With the best kids’ headphones, we checked that they could stand the tests of the ultimate destroyers. Budget: While testing for the best kids’ headphones list, we considered the trade-off between budget and durability. It’s either best to buy them a highly durable set or something that’s easy on your pockets when it breaks. Obviously our preference was to headphones that last longer, no matter what the price. extremely convenient to use and kids love their simple interface. They are highly durable and up for the abuse of regular use. The volume limiter is set a little high but it gets the job done with some parental supervision. 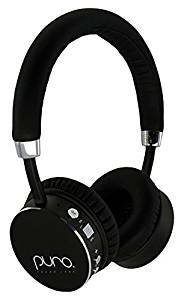 These have been unanimously popular amongst parents and children and top the best kids’ headphones list for that jazz. The LilGadgets Connects+ walk a nice balance between attractive and simplistic. These are highly affordable headphones so they invested on a smart design rather than a niche one. The whole body is done in a single color with the underside done in white. These headphones are made for children of ages 2-8. The headband can extend on both sides by 0.5 inches more. Depending on the shape of your kids’ head, they might fit older children too. These are made of acrylic which is pretty durable based on our stress testing. They can survive multiple drops and some jostling. They are lightweight too. It is volume limited to 93dB. While this is higher than the specified limit, children still complain that these aren’t loud enough. The earcups of these kids’ headphones are small enough to sit correctly on small ears. These are on-ear headphones so they leave plenty of space for air to reach the ears. The pads are soft and lend themselves to the shape of kids’ ears. The headband is padded from ear to ear so they sit softly on the head. The arms of these headbands fold inwards. This reduces the footprint of the headphones to half for portability. The cable of the Connect+ kids’ headphones connects to a single earcup via the 3.5mm jack. But both the earcups have 3.5mm ports. So the spare one can be used to daisy chain headphones. This arrangement allows two or more kids to share audio from the same source. The cable is 48 inches long and gets the kid plenty of distance from the screen. It is braided to relieve stress and reduce the probability of wear and tear. There’s an inline control with a microphone just in case the kids want to play an interactive game. The LilGadgets Connect+ has many takers in the 3-7 age range. These are loud enough without being so loud that they can cause severe damage. We still suggest using a volume-limiter app on the playback device as well. These are highly durable with most people being able to use it for at least a year with normal abuse. Many users have also praised their customer service which was quick to address their concerns and went the extra mile to make their customers happy. are lightweight and come in multiple themes that keeps the children from getting bored of the same colors. The detachable cable has been thoughtfully designed to prevent tangles and share audio. The volume limiter is like a breath of relief for the parents, hence their place in the best kids’ headphones list. The Onanoff kids’ headphones are made of lightweight plastic. These are on-ear cans with slender headband. They are appropriate for ages 3-10. The back of the earcups are have a panel where you can stick stickers and customize the cans. The headphones come with 6 stickers to choose from. You can have your kid pick out their favorite theme and get them to personalize their headphones. These are also sold in different color combinations with white and in packs of two. The headband doesn’t have any padding and it doesn’t require it either, given the light weight of the headphones. The earcups have hypoallergenic cushions that are safe for your kids’ ears. These kids’ headphones have a detachable cable. This plugs into one earcup. This is a flat cord that runs 2.5 foot long. It has a 3.5mm plug on the headphone side. And it terminates in a 3.5mm shared plug. This has a 3.5mm jack and a 3.5mmport where you can plug in another Onanoff headphone. With daisy chaining, up to 4 such headphones can be supported by one source. The flat cable is resistant to tangles also. These have an inline control that has a mic and a playback controls. This allows the kids to play interactive games and talk on a call with parents. The Onanoff headphones are volume-limited at 85dB. So the parents do not have to keep monitoring this aspect. They come with a bag for safe portability. The Onanoff kids’ headphones felt very durable right off the bat, considering the price. But stashing them in the bag might limit their lifetime. So we suggest putting them in a hard case for travel. These sound great for a children’s gadget. They have plenty of punch though adults might find the volume too low. But that’s proof that the volume limiter really works. It kept the volume level even with sudden bursts of static or other noises. The downside is that you can’t use them as noise-isolating cans for airplane rides. The customer care of this firm also impressed us with their diligence and customer-oriented behavior. They reached out to customers who had durability and tried to get them the best deal. through multiple tests for their volume-limiting feature. These will guarantee that your kids listen to audio at a volume that will prevent any damage to their sensitive ears. These are built for durability and reinforced with metal. If you are willing to dig deeper into your pockets, these are the best kids’ headphones in the market. The Puro Sound Labs BT220 kids’ headphones look and feel very different from the rickety budget options in the market. They are subtly done in aluminum and plastic. The headband is completely padded from ear to ear. The earcups are finished in metallic sheens and have beveled edges to prevent any injury. These are on-ear headphones with cushy padding to offset the weight. In spite of their durable build, children found them comfortable enough to wear long term. These are available in 6 different color combinations. These kids’ headphones have on-board controls for playback. These include a power/pairing button, a play/pause button and volume change keys. These connect via the newer Bluetooth 4.0 which transmits more details energy-efficiently. This has a range coverage of 30 feet. You get 18 hours of playback per charge. When they run out of juice, you can use them in the wired mode. Puro claims that the snug fit and on-ear earpieces cancel out 82% of the ambient noise so that even at low volumes, they sound full and rich. The reason being, these are volume-limited at 85dB. These have been extensively tested and came out safe for children as per each one of them. The Puro Sound Labs BT220 kids’ headphones are a great choice if your child is a true connoisseur of music. These are quality headphones with good bass and a detailed audio. They might have boosted the bass frequencies a bit. This, coupled with noise isolation, helps them hear the music over ambient noise. The Bluetooth connection is strong and remains non-choppy through the Bluetooth range. They pair up easily and reconnect within seconds. These are highly durable because of their metal design. But some users have complained of durability issues, it could probably be one weak link. We recommend using them with some care. The earcups can fold flat for portability. way to moderately-sized adult heads. These are so versatile that they can be used as workout headphones as well. The volume slider on the cable has been unequivocally praised by parents. The foldability and light design makes them highly portable. The sheer ease of using them lands them in the best kids’ headphones list. The BestGot Kids’ headphones look pretty large upon the first sight. They are definitely dorky on a 2-year old. But that doesn’t affect the fitment. They fit a 2-year as well as they fit a male teenager. The headband flex prolongs their life. The headband can be extended on both sides to increase the arch size. The earcups are round and go on-ear. They are mounted with plush pads and sheathed in leatherette. The headband is also lightly padded from ear to ear. The arms of the headband fold inwards and turn them more compact for travel. These area available in a number of color combinations too. These kids’ headphones have a detachable cable that connects to only one earcup. The cord is 4.3 feet long and has 3.5mm jacks on both sides. It is sheathed in braided nylon fibers so you kids cannot damage it that quickly. That’s plenty of length to reach DVD players installed in cars. Unlike the Connect+, it can connect to only one earcup. The cable has an inline control with a multifunctional button, mic and volume slider. The volume slider allows you to monitor the exact volume without taking the headphones off of your child’s head. These are lightweight on-ear headphones and they come with a drawstring carry pouch. This pouch is said to be water-resistant. The BestGot Kids’ headphones are budget-oriented, so we did not expect a lot out of them. But they surprised us with their punchy audio. These play without the characteristic boominess or sibilance of usual inexpensive headphones. So children do not have to go for higher volumes to listen clearly. The snug fit also ensures that bass is not diffused and the audio sounds full and rich. These headphones do get a little warm with continuous wearing. But being leatherette, this was expected. For kids, you must make them take off any headphone after an hour’s duration to prevent hearing damage anyway. also allow you to daisy chain with other headphones. These are an excellent option if you want more than one kid to enjoy some audio together and sit away from the source. They also play kicker audio with a volume limiter so the kids need relatively less supervision. These make a great candidate for the best kids’ headphones list. 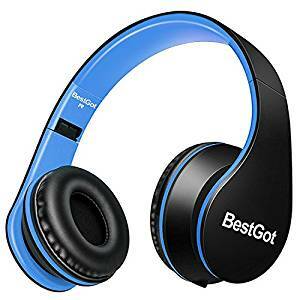 LilGagdgets Pro Premium Bluetooth kids’ headphones look and feel durable. They are entirely colored and the earpads are done in a contrast color. These are available in 5 attractive colors. The headband is padded well. The earcups are mounted with foam pads and all the cushions are covered in perforated mesh fabric. This allows better air circulation and keeps the ears from sweating. The headband has metal extenders which reinforces it and also allows it to fit larger heads. These headphones are meant for children of and above 4 years of age. These kids’ headphones connect to the playback source wirelessly via Bluetooth. While it need not connect with the source through wire, you can daisy chain these headphones and share a single audio source between up to 6 headphones. They can all be connected to each other via a cable and the primary headphones are connected via Bluetooth. The battery lasts through 12 hours per charge. On standby it can last through 180 hours. When it runs out of charge you can connect it via the accompanying 4-foot 3.5mm male-male cable. The cable is braided for longevity. They come with a USB charger. The right earcup has some on-board controls. These include a power button and a volume wheel which is easy to operate. These are also volume-limited at 93dB. So you would require an app on the device to bring it down to 85dB. On the upside, these are more audible than the 85dB-limited headphones. LilGadgets have been lauded by the customers for the excellent after-sales service. They proactively reached out to customers who had trouble with the Premium Pro headphones and replaced them. This is more effort than firms put in for a budget-oriented product. These headphones are children-approved. They do not exhibit any distortion or harshness at high volumes. 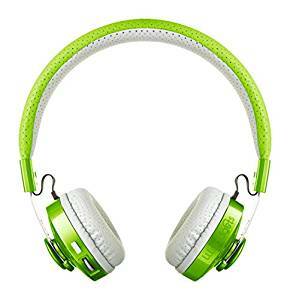 These are highly durable headphones lasting up to 2 years with proper use. However, they require at least some care in handling. The pleather sheathing on the earcups may still peel off over time with regular use. This is a cosmetic issue more than a comfort or design issue. volume-limited and regular playback. These are super-durable too as we hear from the user feedback from people who have used them for over 3 years. At their budget-oriented price, this is a kicker deal. They look funky in their adorable colors too. Their glowing reviews land them in the best kids’ headphones list. The Kidz Gear wired kids’ headphones have a slotted headband design. We suspect that’s why these are so comfy. The headband has a slot in the middle which allows proper ventilation at the top of the head. These headphones fit human of 2 years and above. They even fit teen and adult heads. The earcups are over-ear for smaller kids. They are larger than the usual on-ear earcups on kids’ headphones. The earcups are sheathed in pleather material which uncharacteristically doesn’t peel off so easily. The headband can be extended too. These are available in 5 different color combinations. These kids’ headphones come with a separate volume limiter cable. This can be attached to the primary cable when you want the kid to use limited volume. It can be removed during airplane travel when the engine noise is pretty loud in itself. The actual cable connects to both the ear pieces. We do wish this was single-sided. They also come with another accessory: a splitter cable. This allows two parties to share audio from the same source. A drawstring pouch accompanies them for portability. However, they do not fold so they may take up more space. That being said, they can be stashed in travel bag without the fear of damage. 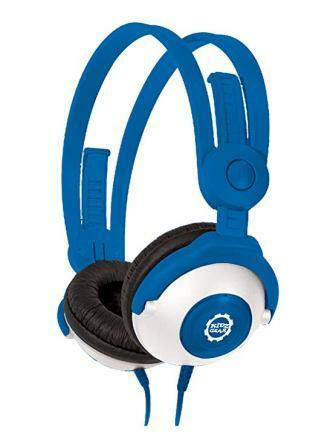 The Kidz Gear wired kids’ headphones use the KidzControl Volume Limit Technology which bars the volume between 80-90dB. These headphones comply with the CPSC/CPSIA safety regulations for kids. 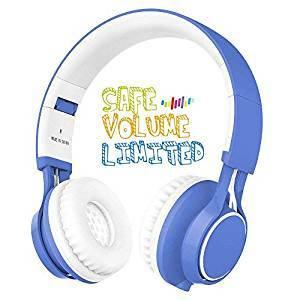 The audio is relatively quiet at these volumes so they are good for everyday use. During commutes, you can remove the cable for normal volume. It’s up to the parents to enforce discipline in this regard though, because the solution isn’t kid-proof. Children love these kids’ headphones for their solid and clear audio. A testament to their clarity is that they are often used for playing audiobooks which require clear and precise presentation of audio. Children not being as picky as audiophiles will like the detailing of the audio and the lack of any sibilance or boominess. and highly portable. They present clear and audible audio for movies, podcasts and audio books alike. The volume limitation makes them safe for children. They have a durable design too backed by a very responsive and concerned customer service. All of this makes them the perfect pick for our best kids’ headphones list. The Snug Play+ kids’ headphones look attractive with their gentle colors. These are designed for children of ages 3-8 but they can extend to fit preteens. The headband is reinforced with metal extension bars. It is properly padded at the arch. The earpieces are of the on-ear type. These are foam pads topped with pleather. The headphones have very low clamp and are lightweight. They are comfortable for continuous usage over hours. Kids have vouched for their comfort over long hours of usage. The arms of the headband fold to pack in a compact space. They come with a cloth pouch for travel. These kids’ headphones are volume-limited at 93 dB. This is loud enough to listen to all sources. They have a detachable cable. This is a braided 52” cable with 3.5mm jacks on both sides. This is less likely to tangle or get damaged by constant tugging. Both earcups have 3.5mm ports too. So you can connect the source to one side and use the other port for daisy chaining more headphones and share one source amongst them. So if you have more than one child, you can use one source and multiple Snug Play+ headphones with them. These are available in six colors. The Snug Play+ kids’ headphones have a good volume range for this device. They are loud enough to play any kind of media but not so loud that they can really damage a kids’ ears unless used continuously for hours. We would recommend exercising some control over the amount of time they spend with the headphones. The audio is clear and has plenty of punch. There’s no distortion at high volumes. These headphones are also backed by excellent customer service. The faulty pieces, if any are immediately addressed once brought to their attention. headphones. The MDR222KD are for kids who have a real taste for good and detailed music. These are focused on delivering great audio and cultivating a taste for clean and balanced music amongst children. These are also for older children and hence fills an important gap in the best kids’ headphones list. The Sony MDR222KD kids’ headphones are slender and simple in their design. These are really lightweight at 4.2 ounces. They have a black headband with subtly colored arms and earcups. The headband is pretty slim and keeps the arch of the head comfortable. The earcups are round and topped with foam. The design is pretty much like that of PC headsets used for Skype. As with those headsets, these are very comfortable for long hours of use. These headphones are designed to fit children of ages 8 years and above. They can fit adults and some younger kids who struggle with the size of kids’ headphones. These Sony cans are volume-limited internally. The cable is connected to a single ear piece. So the kids get better mobility with these on. The cable is a simple rubber cable. There are no extra features like foldability or share cable. Yet these have the Sony mark of quality and durability. The Sony MDR222KD kids’ headphones redeem their lack of features with their audio prowess. These are fairly balanced and relatively more detailed that the regular kid headphones that focus more on the extras. The upside is that they teach the children to value quality audio. The audio is balanced without excessive focus on bass. These are clear and clean along the vocal range. So the vocals are clearly heard above the mayhem of the music mix. The volume limiter really works on these headphones. The audio is quiet so these are best used in environments with low ambient noise. In noisy areas like commute or restaurants, the child won’t be able to hear the audio properly. 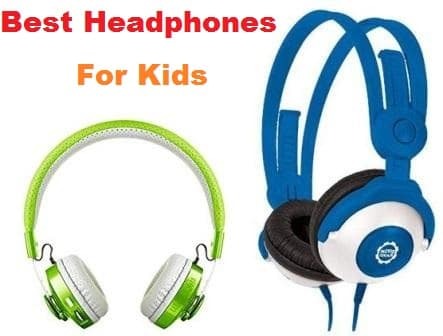 The advantage is that these are safe for the kids who spend a lot of time with headphones one. earphones. These are band headphones that allow your kid to relax while listening to great music. They are also very portable and washable, thanks to the out-of-the-box design. These also double as a sleep mask and the volume limiter helps land them in the best kids’ headphones list. The CozyPhones kids’ headphones are a fabric band with speakers inside. The two speaker disks are inserted into fleece headband. This headband rests on the forehead. They come in different designs like panda, kitty, unicorn and purple frog. These animal caricatures easily reel the children in. The speaker disks are inserted in the band such that they rest over your ears. The fleece band is soft and washable. You can take the speakers out when you want to wash them. These soft bands are much more convenient than the large plastic headphones. In-ear headphones place the drivers very close to the ears and can damage their ears. These kids’ headphones have the cables attached to both speaker disks. This is a 52-inch cord that is braided for extra strength. It ends in a 3.5mm jack. When sleeping, the kids can pull this over their eyes and get some respite from the cabin lights. The CozyPhones are volume-limited to 90dB. So your kids remain relatively safe at moderate volumes. The CozyPhones kids’ headphones are designed for convenience. They go for a safe sound signature that sounds good with all types of media including music and audio books. They do not distort at high volumes or show any harshness. The band is stretchy and can fit the smaller adult heads. Taking the speaker discs out was fiddly at first but that eased up with practice. The cable is stretchy and holds its own against the abuse dealt by children. The designs on the band are steadfast and the decorations do not come off. The fleece is comfortable for wearing over long hours. It makes soft contact with the skin. portable and comfortable for kids with a wide range of head sizes. These are available in some real exciting colors too that kids would love. The larger ear pieces are pack better drivers for clearer sound. The sturdy design adds up to another reason why these are on the best kids’ headphones list. The Elecder i36 kids’ headphones are much better looking than many sets here. 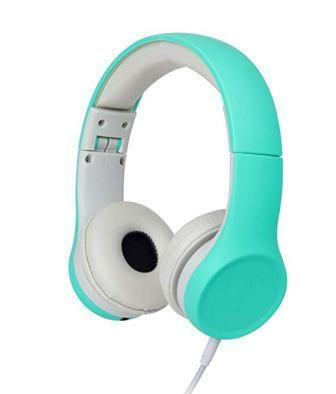 These are on-ear headphones for teens, preteens and even fit adults. The headband is broad but thin. It can easily distribute the weight of the small earcups. The round earpieces are mounted with thick pads and sheathed in pleather. The headband can be extended up to 1.58 inches on both sides. The arms of the headphones fold inwards. This reduces the footprint of the headphones by half and makes them very easy to carry during a journey. The clamp pressure is optimal and even comfortable for kids with Sensory processing disorder. These kids’ headphones have the cable attached to a single side. This is a 4.9 feet cord than terminates in a 3.5mm plug. The cable is braided to protect against daily wear and tear. This also prevent tangles. These cans are available in 4 different colors. Each one is elegant and funky. They don’t have a volume limiter feature which is a shame. It is up to the adults to supervise the volume limits here. An internal volume limit would have been extremely useful since the parent doesn’t have to continuously hover around and ensure that the child isn’t blasting music on full volume. The Elecder i36 kids’ headphones sound full and rich. The large ear pieces allow them to pack larger drivers and push more details into the audio. These pump out enough bass to make the songs sound full-bodied. The audio never feels tinny or distorted. The customer service also stands stanchly behind their product. They are very responsive to user queries and address them in a customer-oriented fashion. Given the budget price tag of these headphones, we didn’t expect such diligence. kids’ safety pretty seriously. So if you have younger kids, these are very safe for their sensitive ears. In fact, these headphones are known for their low volume. 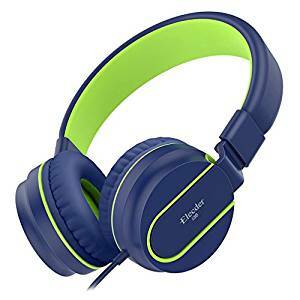 If you are looking to protect your kids from the volume invasion in quieter environments, these are one of the best kids’ headphones. The Mpow kids’ headphones go for the blue and pink themes in their two models. The baby blue version is contrasted by yellow and the baby pink version by magenta. The construction is predominantly plastic. These fit children from the ages of 2 years onwards. They have been tested by kids up to 10 years of age. The headband is optimally padded. The earcups are round and have the on-ear design. These are lightweight and comfortable for long hours of wearing. These kids’ headphones are volume limited at 85dB. They have the cable attached to a single side. This is a flat cable with a rubber sheathing. It actively resists tangles. It terminates in a 3.5mm cable which is compatible all the usual phones, tablets and PCs. The other ear piece has a 3.5mm port which can be used to share audio with another headphone from the same source. The headphones are made of food-grade material. So even if your child tries to chomp on the headphones, he/she will not be ingesting anything dangerous. The Mpow Kids’ headphones sounded pretty quiet to us. So in our tests, we moved to a location with low ambient noise to hear them clearly. They have a balanced and well-designed sound response. There’s plenty of bass backed by clear and high vocals. They proved to be quite durable too in the hands of kids of all ages. volume limiter. These are lightweight and budget cans. Yet they are highly durable and ready for some kiddie mishandling. The vibrant colors and the comfort motivates the children to keep using them. If the volume-limited headphones are too quiet for you, these are one of the best kids’ headphones for you. The Noot K11 kids’ headphones look much like the Elecder i36. We checked out the blue/green model. These are also available in green/coral and baby pink/pink combinations. The earcups are suspended on brackets that allow them to be extended. While they are rated for kids of ages 3 years and above, they even fit adult heads. The headband is brad but thin. It effectively distributes the weight of the earcups. These are larger than the average on-ear earcups. The earcups are large and sit softly on the edges of the ears. These have been tried and found satisfactory by autistic kids as well. The large earcups do not add weight to the body. These are pretty lightweight. These kids’ headphone have foldable arms. The brackets holding the earcups pivot inwards to reduce the packing area. The cord is detachable. These come with a 51-inch cable that terminates in a 3.5mm jack. This is braided for strength again tugging and also resists tangles that way. Do note that these headphones aren’t volume-limited. The Noot K11 kids’ headphones make use of their size to pack larger and fuller-sounding drivers. They might not sound as good as the full-size headphones but they are clear enough for children to watch movies and cartoons. They aren’t volume-limited so they can be used during the commute when the ambient noise is high. 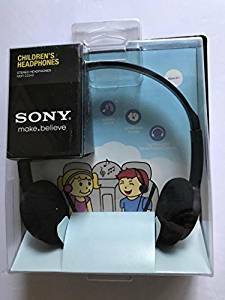 Users applauded the fact that children were able to hear audio clearly out of them as opposed to the volume-limited headphones that are too quiet for some surroundings. They are safe for children only if parents supervise the volume limit. We also put them through some serious stress tests and they came out well in terms of durability. The cord is especially strong for the way children treat their toys.
. These are an adorable set with inline controls for when children spend time on calls with their parents or favorite aunts/uncles. They are portable and built for durability. These check all the boxes to be on the best kids’ headphones list. 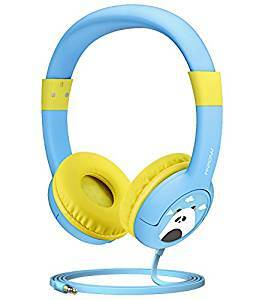 The Ailihen HD30 volume-limiting children’s headphones is clearly made for children with their cute panda design on the earcups. The headband is padded along the arch for comfort. The earcups are on-ear and round. They are mounted with foam earpads and sheathed in pleather. The headband can be extended to fit larger heads. These are recommended for children of ages 3 and above. The arms of the headband fold to reduce the overall footprint of the headphone. So these will fit easily in their school bags or travel bags. The earcups can swing forward slightly to hug your head for a snug fit. These kids’ headphones have a braided cable that connects to a single side. It has an inline control with a single button for play/pause and track forward. It also has a mic so you can make calls hands-free using these headphones. This cord is less prone to tangles than regular rubber cords. The cable is detachable too, so if it fails, it can be easily replaced. It is pretty long so it can reach the DVD player or the tablet placed away from the eyes of the kid. The Ailihen HD30 kids’ headphones are volume-limited at 93dB. This is just loud enough to hear the music in a room with regular amount of noise. Usual kids’ headphones are very quiet because of the 85dB volume limit. And the kids might get annoyed by the lack of clarity in noisy places. The HD30 sounds clean and crisp especially in a noisy room or in the plane. The audio is loud and punchy. The audio of these headphones have been approved by the kids. It has the necessary volume range to keep them engaged in the audio. young kids. The audio is full-bodied and safe for kids so they don’t need continuous parental supervision. These are also made of nontoxic materials so that’s another step in children’s safety. Except for that fact that these cannot be folded they are poised for the best kids’ headphones list. 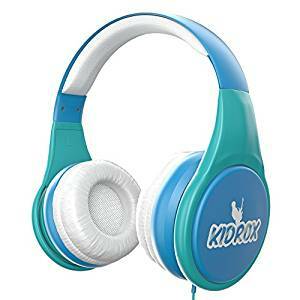 The KidRox RS4 kids’ headphones are specially designed for younger kids of ages 2 and above. These are BPA-free and made of non-toxic substances which effectively makes them safe against children who like to munch on their toys. These have a flat and broad headband and round earcups. The ear pieces are mounted by soft pads and sheathed in pleather. They provide good air circulation while maintaining a snug fit. The headband can be extended on both sides to fit older children. These kids’ headphones are volume-limited at 85dB. This is within the safe limits but we still recommend not letting the kids use them for long hours. The cable is connected to only one ear piece. This gives the kid better mobility when the headphones are on. The cord is long and terminates in a 3.5 mm jack. They can plug into any device with a 3.5mm jack. They aren’t foldable like our other picks so they are slightly less portable. These are available in 3 colors. The KidRox RS4 kids’ headphones do not get very loud courtesy their volume limitation. However, they have adequate bass to sound full when playing music and cartoons. They cannot be used in noisy environments like airplane or a public place. The kids will simply not be able to hear the audio clearly. For classrooms, we recommend headphones with a 93dB limit so that they can listen to their assignments clearly. These are backed by excellent customer service. They get back to customers immediately in the event of any issue. Leapfrog devices and all other gadgets with a 3.5mm ports. These are designed to last and aren’t limited in volume since the audiobooks need to be audible. 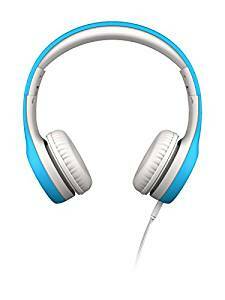 They are an excellent aid in the child’s learning process and hence their place in the best kids’ headphones list. The Leapfrog kids’ headphones are sturdy and designed for comfort. They look and feel their substantial price. The headband is padded opulently and comfortable for long hours of use. The earcups are larger than the usual on-ears. They are also padded lavishly and are deep. They might even cover a toddler’s ear in an around-the-ear fashion. 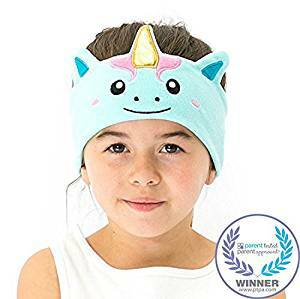 These do not fold but the headband does extend to fit a range of head sizes. These kids’ headphones have a detachable cable. It connects to a single earcup and terminates in a 3.5mm jack. It is compatible with LeapPads, LeapReader, Leapster GS and LeapFrog Epic devices. They also work with regular iPads and other tablets. The cord is really long and can reach devices placed at some distance to protect their vision. 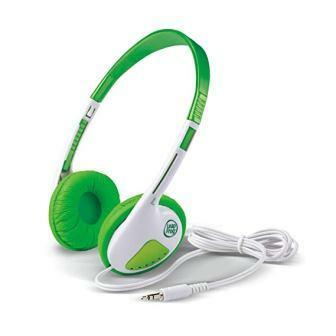 The LeapFrog kids’ headphones are designed for audio books and hence sound very clear with the vocals. They pump punchy bass and strong highs too. Overall you get better quality audio than the cheaper kids’ headphones. The audio is pretty substantial and also has a large volume range so the child can listen to the words over ambient noise. Leapfrog also offers responsive customer service so your investment is protected by their interests.